The lovely brick exterior to La Rosa - the new Mexican restaurant in downtown Santa Rosa. Unfortunately, the food doesn't come close to measuring up. This past weekend we headed out with the family and some friends to check out the new restaurant in downtown Santa Rosa. Ever since the Cantina closed, we’ve been looking forward to checking out its replacement. 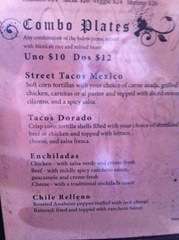 The restaurant is set right on 4th Street, which is a great location at the heart of the city. There is street parking and several public parking lots nearby. 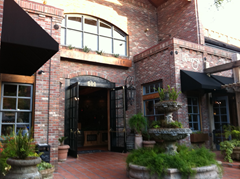 The large outdoor patio area is still there, complete with renovated heaters for those cool wine country nights. You enter the restaurant through oversized doors, past a large fountain. (A holdover from the previous restaurant). Inside, a brick wall decorated with crosses forms the backdrop for a pleasantly trickling fountain. We didn’t make reservations, but at 6pm on a Saturday night, we had no wait to be shown to our table for 4 adults and one child. The restaurant provided a high chair for our toddler, and a kids’ menu with crayons for her to color. Our booth was plush and comfortable, but the restaurant was so loud that it was difficult to hold a conversation. On the plus side, loud restaurants mean fewer worries if you travel with baby! evening with an appetizer of vegetarian nachos. 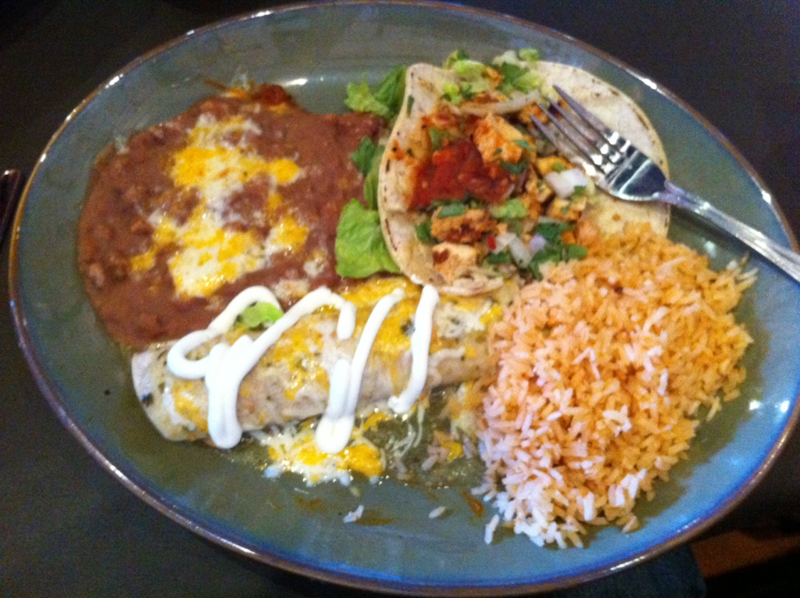 The small portion arrived smothered with cheese and on the soggy side but tasty non-the-less. 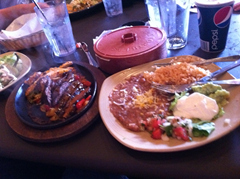 It was when our main meals arrived that our experience at La Rosa began to go downhill. 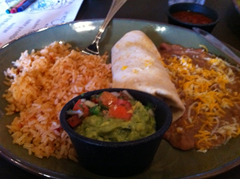 First off, our friend noticed that her burrito was missing all the promised fillings. 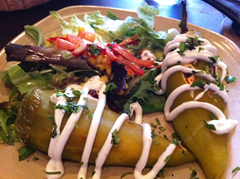 Then, Wendy noticed that her chile relleno didn’t bear much resemblance to the restaurant menu’s description, either. 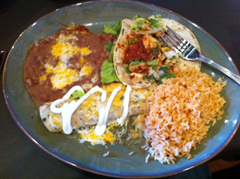 A quick check revealed that it was nothing like what had been described – no Jack cheese, no breading, no ranchero sauce and no beans or rice. Instead, the chiles were plain, stuffed with what was apparently goat cheese and roasted red peppers, and served with a small side of salad. Thankfully, the other two meals were what was ordered, and Ian’s steak and chicken fajitas were good and our other friend enjoyed his meal, too. Still, we were hoping for better than two out of four meals correct! We told our server about the issues with our food. In fact, our friend called her over right away to point out that there was next to nothing in her burrito and it was definitely the kid one. The waitress offered to have another one made, but since we were all already eating, our friend chose to just go ahead and make the best of it. The waitress also solved the mystery behind Wendy’s meal – they serve a chile relleno appetizer at the restaurant, and that’s what had been made. She apologized for the mistakes and explained that the restaurant is still new – having only been open for six weeks. She also told us that the kitchen staff were overly busy and that they sometimes just “get in the zone” and don’t really pay attention to what’s ordered. We were never offered dessert, coffee or anything else complementary to compensate us for the two wrong meals, although at least the prices on the bill reflected the meals we were actually brought rather than what we had ordered. 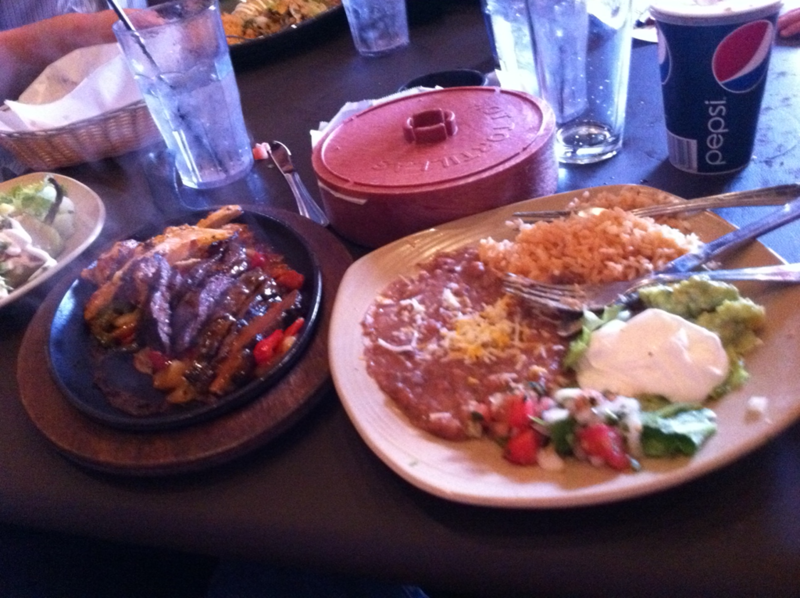 Ian's fajitas at La Rosa - the new Mexican restaurant in downtown Santa Rosa - were actually good. We left feeling very unsatisfied with the experience – little did we know it wasn’t over! That night, our toddler wound up throwing up in the middle of the night. We definitely cannot recommend eating there! So, if you’re in Wine Country and looking for somewhere to eat, we’d suggest heading for Ca’Bianca –a great Italian restaurant that will charm you with their wonderful service, lovely setting and delicious food! I’ve had food poisoning in a great restaurant, great location and very pricey. So pricey it cost me $800 in medical fees after it too. I think it happens to the best of us. It also goes to show it’s not only in dirty markets that you can get sick. I too got food poisoning from La Rosa in Hamilton, Ohio. It’s a horrible thing to have. We have never had a problem before until now. It was so bad I just wanted to die. I thought I was going to die. The most painful thing I have ever been thru. I don’t care to repeat it. I knew it was not the flu. I had no fever or chill. Nor did I have aches. I am in good health. I knew it was the food I had ate from their restaurant cause with in 45 min. I was deathly ill. Vomiting and then I started getting sick at the other end. To the point it started at 7pm until 3am.. Then I finally got some rest (crying my eyes out to sleep) then when I woke up at 6 am the second wave hit lasted a few hours. I am just now getting the color back to my skin. I am very tired and I am so glad that I didn’t eat the rest of my dinner. I wouldn’t even feed it to my animals. I just tossed the rest into the trash. I knew it was from their food. I had not ate anything all day. The other people in my party ordered chicken alfredo and I got a calzone. I would not wish this on any 1.. not even a person I didn’t like. You really feel like you are going to die. Even luke warm water sent my stomach in a painful attact. You never know what has been done to your food unless you cook it yourself. Even then the tons of recalls in the US on food is out of control. Can’t trust anyone unless you raise it and cook it yourself.